Glory Legend Cruise is a modern and tastefully designed boat. The boat features spacious, well-appointed cabins and suites with large en-suite bathrooms, large sundecks with comfortable lounging furniture and elegant dining rooms and bars. We have designed and fitted our boats to international standards while maintaining traditional style, creating the perfect balance of modern comforts and nostalgic ambiance. 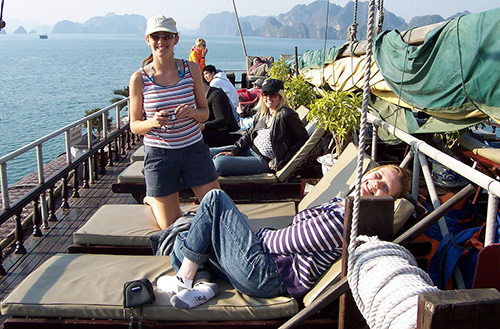 Glory Legend Cruise offers an elegant, relaxing and fulfilling ways to explore endless style in Halong bay. 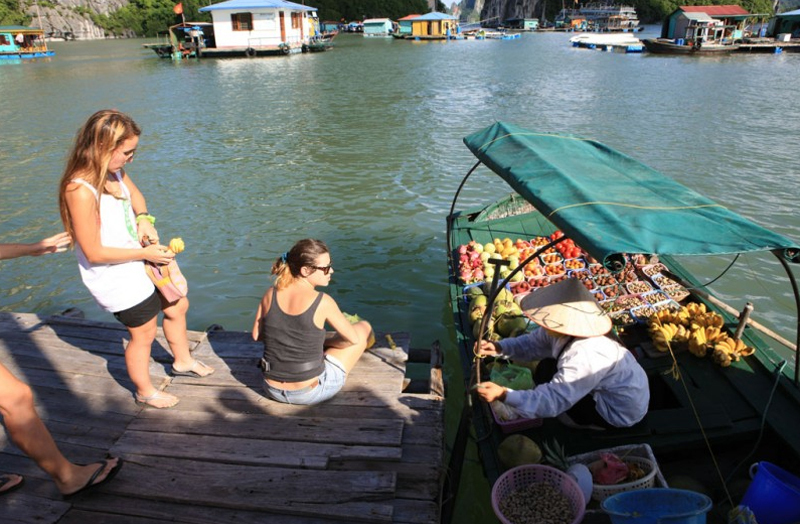 The cruise brings us into contact with local people in different floating villages of the Halong bay. With Glory Cruise, you will have ample opportunity to see Vietnam in its authenticity and sample local culture and food, in a one unpacking, unforgettable vacation where your “floating hotel” get you insight into Halong bay Vietnam. Our goal is to offer a soothing as well as stimulating experience that you will remember and cherish. 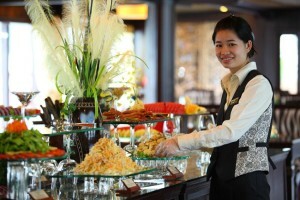 Our dedicated and professional management and staff await you and look forward to serving you on magnificent Halong Bay. Glory Cruise is proud of being the perfect product of luxury in Halong Bay, setting new standards with an internationally led team, spacious and smartly designed cabins, and panoramic balcony views on selected cabins and exceptional personalized on board service. 7.30 – 08.00: Pick up from your hotel in Hanoi. Drive to Halong City through the paddy fields in the Red River Delta. 13.00 – 13.30: Check in and enjoy Welcome Drink, receive cruise briefing and safety instructions. 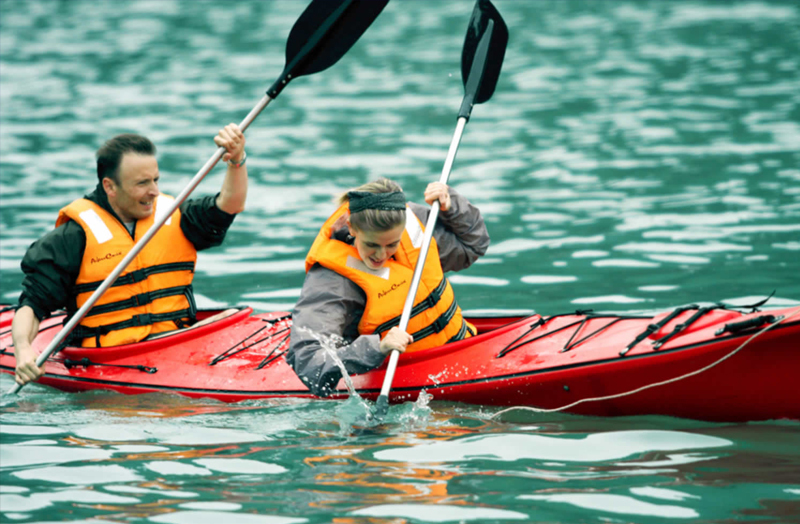 15.00 – 15.45: Visit Luon cave by bamboo boat or kayaking based on your preference. Enjoy quiet space and pure air, you will feel relaxed truly. If lucky, you will have chance to see monkeys on islands. 15.45 – 17.00: Visit the beautiful Soi Sim or Ti Top beach for swimming if the weather permits. Or you can reach on the top of Soi Sim beach to have a panorama view of Halong Bay. 17.00: Back to the boat and free time. 18.30 – 19.00: Cooking class on sundeck – How to make spring rolls. Then enjoy Sunset Party together and Happy Hour (buys two drinks, gets one free from 18.00 to 19.00). It is time for chit chat and relaxing. 21.30 – 23.00: Evening activities include: Leisure time to enjoy a chat around the bar. Watching movies and many sorts of Vietnam cultural films. Relaxing and spending a romantic night on Glory Legend Cruise’s music. Reading magazines in room and dining room. Passengers may also try their luck with squid fishing. 06.15 – 06.45: Enjoy Tai Chi instruction on the sundeck (duration about 30 minutes). 10.00: Have brunch (breakfast/lunch) while cruising back through Halong Bay to the pier. Relax on the sundeck or in the dining room enjoying the bay scenery as we approach the pier. 12.00 – 12.30: Return from Halong to Hanoi by shuttle bus. Everybody knows Ha Long Bay is one of the world’s cultural heritage sites, but not all of them know why it is claimed as a heritage. Ha Long is famous for its beautiful scenery, great natural creations, fresh air and a wonderful climate for tourists who want to get away from the busy life and to discover the gift of The Creator. Ha Long Bay is located 170 km from Hanoi; far enough for tourists to enjoy the fresh air. The Bay contains nearly 3000 islands and islets and gorgeous beaches which make Ha Long Bay so attractive. 15.45 – 17.00: Visit the beautiful Soi Sim beach for swimming if the weather permits. Or you can reach on the top of Soi Sim beach to have a panorama view of Halong Bay. 10.30 – 11.15: Visit exciting Vung Vieng fishing village by local rowing boat, the village is free from busy roads and streets, electric lights and skyscraper. 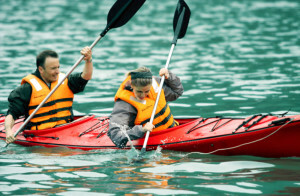 Instead, there are only a few of boats and rafts. You will have chance to discover traditional culture and customs of fishermen. 11.15: Back to cruising. Vietnamese Lunch is served on boat. 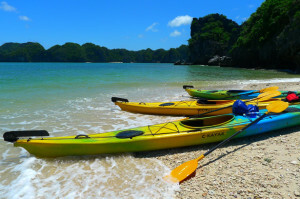 12.30 – 14.00: Kayaking and swimming at Vung Ha, a pristine natural beach lapped by turquoise water. Possibility of kayaking through an amazing tunnel carved under a limestone mountain. 19.30: Dinner – Deluxe Vietnamese and International Set Menu Dinner. 21.00: Evening activities include: Leisure time to enjoy a chat around the bar. Watching movies and many sorts of Vietnam cultural films. Relaxing and spending a romantic night on Glory Legend Cruise’s music. Reading magazines in room and dining room. Passengers may also try their luck at squid fishing from the boat. 07.45: Transfer by tender to the Sung Sot Cave. Walk up about 100 steps to the cave entrance and tour the cave for approximately 45 minutes. Walk down about 100 steps and return to the boat. Proper shoes are highly recommended. Meals on board are fusion: Vietnamese, seafood & international. Guests should advise of any special food preferences, allergies or dietary requirements at least 3 days prior to the cruise date. Advanced registration is required with full name, date of birth, nationality, gender, passport number and visa expiry date for all passengers. A valid passport is required upon check-in. Otherwise, boarding may be denied by port authority.